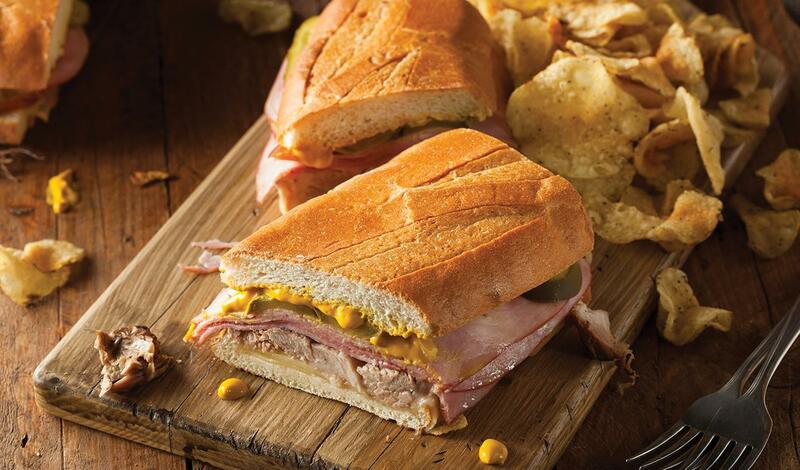 A Cuban sandwich is a variation of a ham and cheese sandwich that originated in cafes catering to Cuban workers in Key West and Ybor City, Tampa. Later, Cuban exiles and expatriates brought it to Miami, where it is also still very popular. The sandwich is made with ham, roasted pork, Swiss cheese, pickles, mustard, and sometimes salami on Cuban bread. Whisk all dry ingredients/ spices into the boiling water, until well combined (approx. 30-40 seconds). Add the filtered water (room temperature), lime and orange juices and zest, stir well for another 15-20 seconds. Once the brine is cooled, place the pork shoulder inside the brine, in a large container that fits both the pork and liquid. Refrigerate for 24-48 hours. Remove pork from brine, pat dry with paper towel. Brush pork with extra virgin olive oil and season with coarse salt. Place pork on a rack in a roasting panand cook/sear for 25-30 minutes or until a good golden color is achieved. Lower oven temperature to 225F and cook for 5 hours or until pork is fork tender. Spread butter onto Cuban bread halves. Layer with ham, pork and Swiss cheese. Place open Cuban bread with cheese and meats on a medium-high griddle for approximately 90 seconds. The bread should be toasted and cheese should be melted. Add the mustard and pickles.Close the sandwich and press on the griddle for another minute. Cut the sandwich in half and serve with potato chips.